Less is known about the energy pathways involving FPOM than CPOM. One source of FPOM obviously is the breakdown of leaf litter (Figure 7.3) as fragments from mechanical breakdown and shredder activity enter the water column. 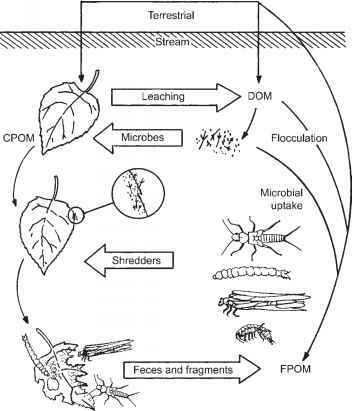 When one includes the production of feces and the eventual contribution of leached DOC to formation of fine particles (discussed below), it is apparent that a large fraction of leaf litter eventually becomes fine particulate matter. In addition, microbial activity on the leaf can result in the release of leaf and bacterial cells and the hyphae and conidia of fungi (Gessner et al. 1999). FPOM also is transported into streams from the terrestrial landscape by wind and runoff, and can be formed from DOM primarily by the incorporation of DOC into microbial biomass. These sources are difficult to trace and potentially of greater magnitude than FPOM derived from leaf fragmentation. The term ses-ton includes all suspended particles, and so organic seston is used synonymously with FPOM. The presence and activity of microbial populations on fine particulates is measured in a number of ways. 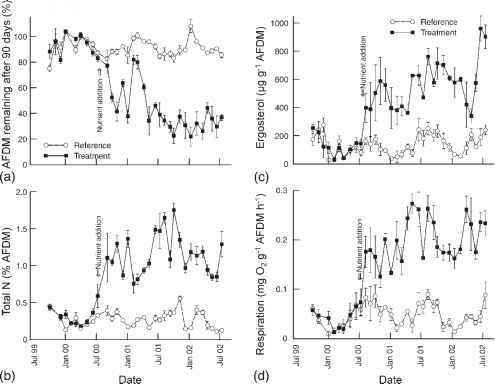 Cell counts and ATP concentrations provide estimates ofbiomass, while respiration rates, enzyme assays, denitrification potential, N-fixa-tion rates, and uptake of labeled substrate provide estimates of metabolic activity (Bonin et al. 2000, Findlay et al. 2002). Because bacteria become more abundant in the later stages of CPOM processing, and the small size of FPOM suggests a reduced role for fungal hyphae, bacteria are likely to dominate microbial populations on fines. This expectation is supported by a study conducted in nine headwater streams in the United States, where bacteria were found to dominate fine ben-thic OM whereas fungi were more abundant in larger material (Findlay et al. 2002). However, compared to the extensive data on leaf breakdown, less is known about the eventual fate of FPOM (Ward and Woods 1986, Ward et al. 1990). Rates ofprocessing, resemblance between FPOM and its source, nutritive value, and eventual fate all are poorly understood.